pictures - Cake Boss rules! This is probably the most famous baker in America- Buddy Valastro. He is the star of the tlc reality show "cake boss". 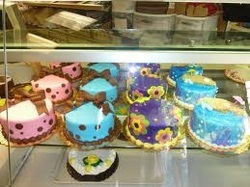 These are some sample cakes from carlos bakery. They are not speacialty cakes so anybody can buy them. This is what Buddy is all about- famiglia. Here are some pastries. 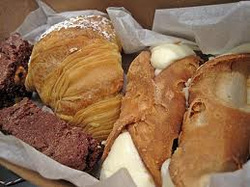 On the right are canollis's, in the middle is a lobster tail. I know what you are probably thinking and yes, this is a life size nascar cake. It is a record set by carlos bakery, along with other bakeries that helped. This is the famous "cake boss" logo.